In December of 2005, ABC's Extreme Makeover Home Edition came to Blacksburg, Virginia to make over the Smith Family's Home. I had the opportunity to meet the show's designers and work with Paige Hemmis on one of the children's rooms. One of my sculptures became a featured part of the science themed room. The Extreme Water Cycle uses rolling balls to represent water molecules as they move through the water cycle of Earth's ecosystem. The idea for this sculpture has long been in the back of my mind as a practical way to illustrate a scientific concept using rolling balls. As I brainstormed ways for one of my sculptures to fit within the theme of the room, I recalled this idea and found it to be a natural match. Paige Hemmis and Michelle Weller, one of the show producers, agreed that the water cycle sculpture would fit well within the science theme of the room. If you aren't familiar with the show, the premise of Extreme Makeover: Home Edition is that ABC finds a deserving family that could really use a home makeover, completely remodels their home, which usually consists of demolishing the entire house and starting from scratch, and finishes up EVERYTHING within one week. It is a very hectic and fast paced schedule which is completely based on volunteer help and donations from citizens and companies from the local area as well as the entire united states. The water cycle is represented by this rolling ball sculpture. Blue balls represent water molecules as they move through the atmosphere. 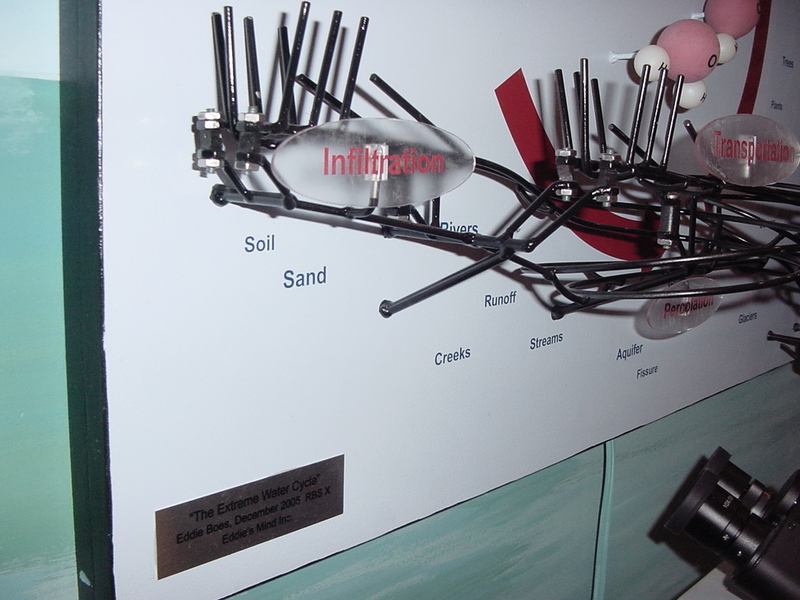 The Extreme Water Cycle is a wall-mounted sculpture with one screw lift that feeds one-inch balls to two interconnected tracks. The balls move through the sculpture in a figure eight pattern. When the balls come off the lift, the ride down a straight track, free-fall vertically onto a catch point, and roll back to the lift. 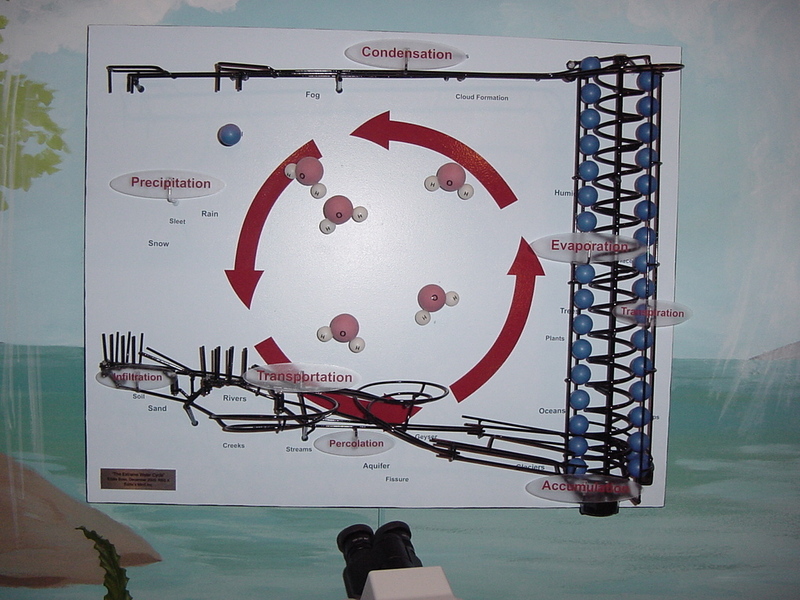 Though the Extreme Water Cycle is a very simple sculpture, it is very effective at communicating the scientific principles. The screw lift represents the evaporation of water using the constant vertical motion of the blue (water molecule) balls. The track on the top of the sculpture represents the condensation of water vapor as the balls roll across the top, as if traveling though the atmosphere in clouds. At the end of the track, the balls stop and free-fall, representing the saturation point of the clouds and the resulting precipitation. As the balls are caught at the bottom of the fall, they roll along a spiraled track, representing the infiltration, percolation, and transportation of water in and on the ground. 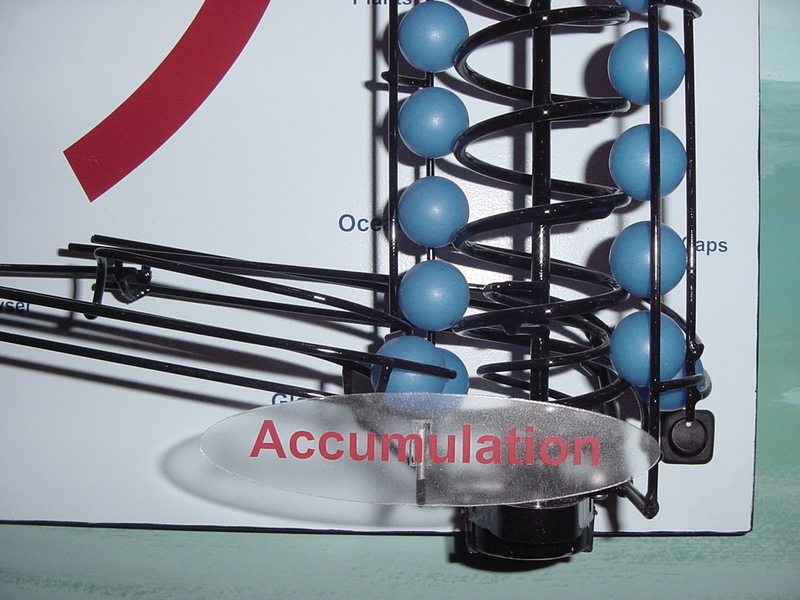 At the end of the track, the balls collect at the bottom of the lift at the point of accumulation. All of the key terms associated with the water cycle are printed and displayed with the associated sculptural element. On the back board, small black words provide more specific aspects of the key term. For instance, behind the precipitation key term, forms of precipitation, such as rain, sleet, and snow are displayed. The balls falling around the key term further reinforce the idea. By presenting all the key terms with the associated specific aspects, the sculpture takes on a more scientific tone. 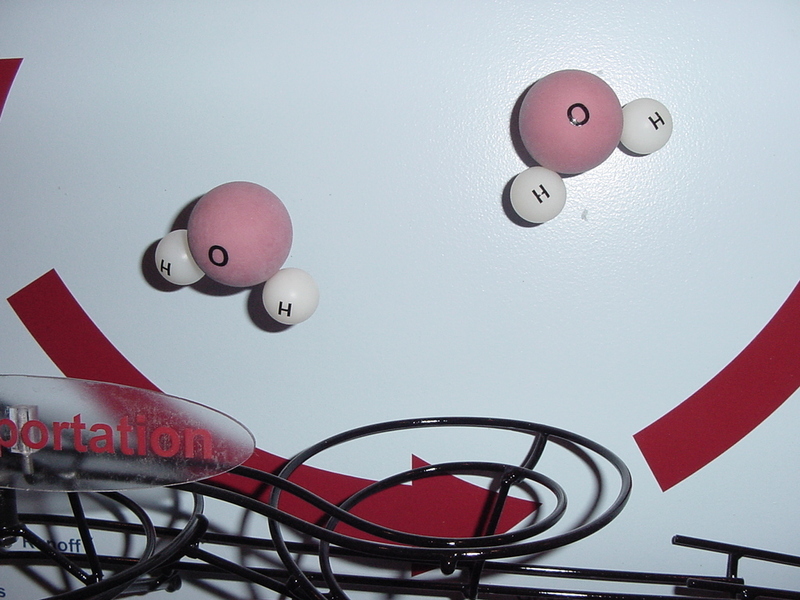 To add to the artistic side of the sculpture, I created small water molecules and appear to float within the center of the cycle. All the plastic parts were laser cut and the words and arrows are adhesive vinyl appliqué. The track is 1/8th inch diameter stainless steel painted black to fit within the color scheme of the room. Everything was cut, bent, painted, and delivered in three days... three... very... long... days. The background wall was originally going to be a solid color with no painted mural. However, during brainstorming, we thought the idea of the water cycle could be extended beyond the borders of the sculpture and onto the back walls. The Mural was painted by Nancy Hadley, one of the scenic artists with Extreme Makeover. The show aired on ABC on February 12, 2006.